Usually I can get most of my projects done in a day or less. This is more of a commitment. While I have made quite a few quilts before, this is a more involved project. 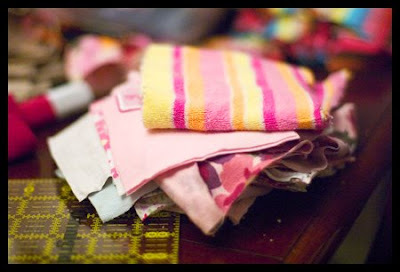 There is also a lot of evidenced tucked around suggesting that I don't always finish my quilts. Or start them. It's a memory quilt made using Aubrey's old clothes. This is sad. I pulled them out last night and I could not cut into them. I'm not much of a crier, but if I was, I would be bawling. Over clothes. As it was, I couldn't think about it too much, or I would have been gone. She is so big now and she used to be so little and she's my baby and she's the only girl I'm ever going to get to dress on a regular basis and little girl clothes are so cute and dang I miss having a baby. These are some cute clothes. I bought most of my boys' clothes 2nd hand and a lot of them were worn out by the time they got to Griffin. Most of them were worn by Hyrum or Miles as well. They are good clothes and they have fought a good fight. I'm planning on cutting them up at some point and doing a similar quilt, and when that time comes, I will happily send them to the great beyond to be born again as quilt pieces. This is not the case with Aubrey's clothes. I bought most of them new, just for her. She's the only one who wore them. Some of them are still in quite decent condition. I feel bad killing them when they have hardly started to live. This morning, I started with the more worn looking ones. It may still be a few days before I can bring myself to cut the nicer ones. Anyway, for visual progress, here's a picture of the design. Yes, I am geeky enough to have a program called Electric Quilt. It's handy for designing your own quilts. You can automatically change the size of the blocks, design blocks, and boarders and generally have a fun time playing with the layout of your quilt. 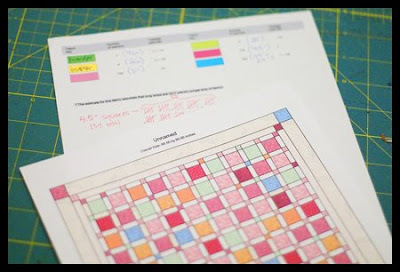 You can even scan the fabrics in if you want to color your quilt. I don't do this for two reason. 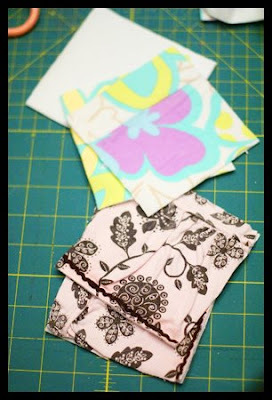 It takes all the fun out of sewing your quilt and not knowing exactly what it's going to look like in the end. AND, I'm lazy. And here is one of cutting the pieces out. This is going to take the most time. It is hard to get those squares right when they are made out of knits and things, and pretty much everything but nice, flat, easy to cut quilting cotton. 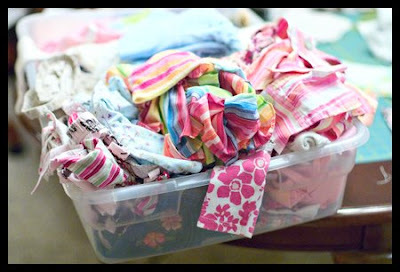 I came up with a brilliant plan to get around buttons, ruffles and not flat fabric. I cut out the same size squares from flannel and used spray adhesive. I'm layering the clothing on top the squares, which will help me get square blocks from clothes that are not in the least bit square. It should make it easier to sew as well, as the knits won't stretch and pucker as I go. I love the pattern but curious about the computer design tool. Is it one you have made yourself or bought.